In yoga this week, my amazing teacher, Kyle Miller, was talking a lot about karma. We walk around so much of the time dissatisfied with one thing or another. You know the drill: "I wish I had a boyfriend," "I just want love in my life," "I don't know why my friends aren't nicer/more loyal/more compassionate." "My co-workers totally don't respect me," "My great-aunt's best friend's brother is driving me bats*%t crazy." And we struggle trying to figure out how to fix things, forgetting that the easiest way to change things is to change yourself. If you want more love in your life, be more loving. If you want the people around you to be kinder and more compassionate, show them kindness and compassion. If you want more respect, respect others and respect yourself. A lot of the time, our natural instincts veer towards more of a "monkey see, monkey do" attitude. If someone is rude to you, you're going to want to be even ruder back to them. If a friend fails to show up for you, you suddenly lose all desire to be a good friend to them. But that's the wrong line to take. Kindness begets kindness, courage begets courage, love begets love. So be brave. Say "I love you" first. Help the mother with her stroller up the subway stairs. Forgive and (really) forget. Let it go. Everything starts with your thoughts and actions. 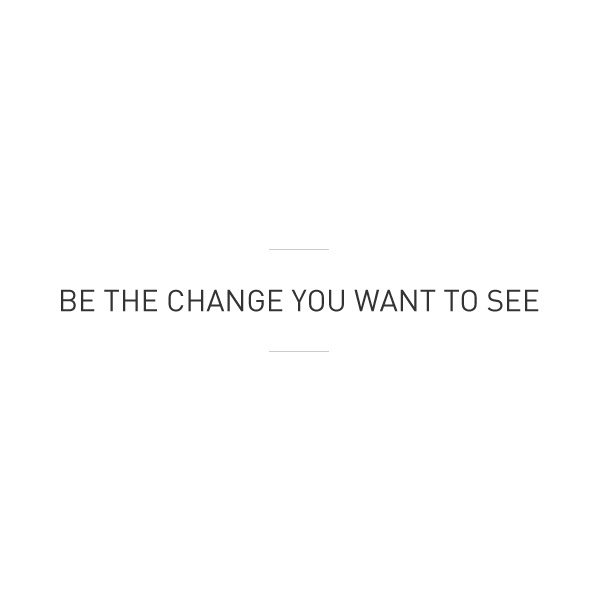 As Gandhi so famously said "Be the change you want to see."